Wow! This release schedule…let’s just say I’m glad I don’t usually have three releases in six weeks. Another story goes live today. 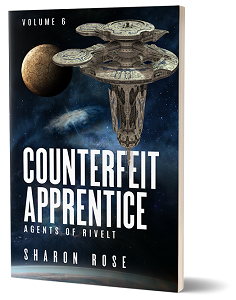 Counterfeit Apprentice, volume 6 in the Agents of Rivelt series, is now available. If you pre-ordered, it should be on your e-reader. I had some fun with alien cultures in this one, and of course, it’s always a delight to dream up an impossible rescue. Believe it or not, I don’t know how Tracy and Vigard will pull it off when I first create the problem. That’s what makes these short stories so much fun to write. My website has a new look. Check it out and let me know what you think. It’s time for me to recharge. I’m off to visit family and enjoy some ocean waves in San Diego. Hopefully, Minnesota will rediscover how to do springtime before I return. Until then, I hope you find something new and exciting to explore.